across Canada to help you pay simply and securely in stores and in apps. We’ll be rolling out support for top banks over the next several days, and this is just the beginning. We will continue to add even more features, banks and store locations in the coming months, making it even easier to pay with your Android phone. Now, you’ll be able to use Android Pay at hundreds of thousands of shops across the country that accept contactless payments, like Tim Hortons, Loblaws, Petro-Canada, McDonald’s, Indigo, Pizza Pizza, Sears Canada and more, and in TELUS, Rogers, Fido and Freedom Mobile retail stores. Just tap with your phone as you would with your participating credit, debit or prepaid card. It’s that simple. You’ll also be able to breeze through checkout in your favourite apps, including Lululemon, Uber, Ritual, HotelTonight, and more. Just look for the Android Pay button, and say goodbye to entering your payment and address details each time you buy. Android Pay also stores your gift cards, loyalty cards and special offers right on your phone. Using Android Pay is simple. Just wake up your phone (you don’t even have to open an app or unlock it), hold it near the payment terminal, and voilà — your payment is done. After you check out, you’ll get helpful information on your phone about your recent transactions. To get started, install the Android Pay app from the Google Play Store. It’s available on all Android devices that are NFC-enabled, supporting Google Play Services, and running on KitKat 4.4 or higher. Simply open, set up, and get tapping. Over the next several days, Android Pay is rolling out with support from eligible Visa and MasterCard credit cards from BMO Bank of Montreal, CIBC, Banque Nationale, Scotiabank, Desjardins, President’s Choice Financial, ATB Financial, and Canadian Tire Financial Services in Canada, and prepaid Scotiabank and Desjardins cards. Support for Interac-branded debit cards will begin roll-out on Monday, and support for American Express cards and Tangerine is coming later this summer. You can add multiple eligible cards and select which card you want to use before you pay, so you can always enjoy the best deals available. We've teamed up with many leading payment platforms, processors, and technology providers such as Moneris, Bambora, Chase, Cybersource, First Data, Global Payments, Paysafe, WorldPay and Stripe to make it even easier to accept Android Pay. Visit the Android Pay API developer site to learn more. 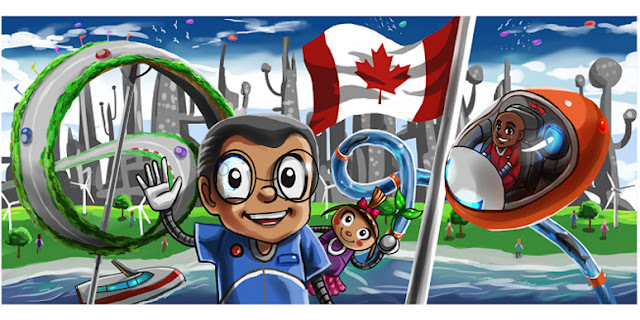 Celebrating 10 years of Street View in Canada and around the world! scale mountains, take a tour of the Canadian Memorial at Vimy Ridge, scout out the best Street Art in Montreal, and walk through Canadian museums. Over the last decade, a lot has changed—the technology we use, the appearance of the planet—but the goal of Google Maps has remained the same: to help you navigate and discover new corners of the world. Now raise your glass (or smartphone), and cheers to Street View’s 10th birthday! Let’s hop inside our time machine and see where it all began. 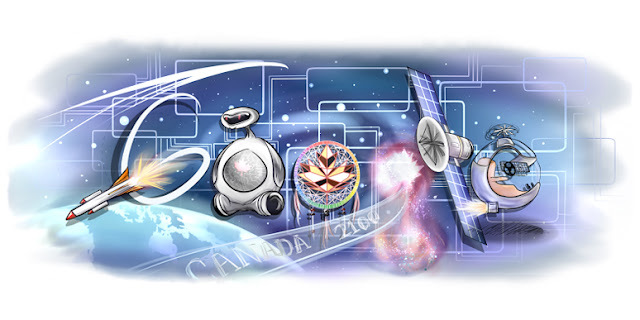 Larry kicked off the first prototype in 2004 with a team of Googlers who were passionate about his idea to create a 360-degree view of the world. They tossed cameras on a van, added some lasers (okay maybe it was a bit more complicated than that), and the first Street View car was born. In 2006, Street View officially hit the roads in a few cities across the U.S. and the first imagery was published in May 2007. In Canada, Street View cars came up to Montreal through Vermont in September 2007 with the first image being of Highway 55. Ten years later, we’ve published imagery on every continent, in 83 countries, and traveled about 10 million miles with the Street View car. Talk about a roadtrip. While our cars explored streets around the world, we were still missing out on some of the most beautiful places on Earth: the world that exists beyond the roads. So we developed custom rigs, like the Street View Trekker, to go where cars couldn’t go. The Trekker is designed to be worn and walked through narrow alleyways or trails, gathering images as it goes. It’s traveled to breathtaking natural wonders and world heritage sites—Grand Canyon, the Taj Mahal, Angkor Wat, the Galapagos Islands and even the historic pedestrian paths in Venice. And it's been used by conservation organizations to observe wildlife, like elephants, chimps, polar bears, and frogs in the Amazon, in their natural habitat. Over the years we've put Street View cameras on a snowmobile to bring you closer to the Arctic Eiders, the back of a camel to roam the Arabian desert, and a trolley to give you a better view of renowned works of art. To build our map of the world faster, in 2013 we enlisted the help of partners through the Trekker Loan Program. We gave volunteers Street View cameras, which they used to collect 360-degree imagery of the local places they know best. Then the Street View App came along in 2015, so that anyone could publish photo spheres (360-degree panoramas) of their favorite places from around the world—or around the block—to Google Maps in an instant. We expanded on this last month, when we announced more than 20 new Street View-compatible 360 cameras, to help you document your adventures with high quality imagery. Now anyone—from tourism organizations to local neighborhood enthusiast—can contribute panoramic imagery to Street View. The world is better explored than explained. Street View gives you a taste of the places you’ll see in person one day, helps you remember the places you've been, and enables you to explore the places you might never get to. So pick up your phone and take a peek. Many wonders await. Street View started out as Larry Page’s far-fetched idea to create a 360-degree map of the world. Today, 10 years after the first imagery was published in Street View, Canadians can scale mountains, take a tour of the Canadian Memorial at Vimy Ridge, scout out the best Street Art in Montreal, and walk through Canadian museums. Over the last decade, a lot has changed—the technology we use, the appearance of the planet—but the goal of Google Maps has remained the same: to help you navigate and discover new corners of the world. Now raise your glass (or smartphone), and cheers to Street View’s 10th birthday! A spacesuit that lets astronauts walk on Mars. Robots that cure cancer. Machines that turn garbage into paper. Waterslides that transport you everywhere. 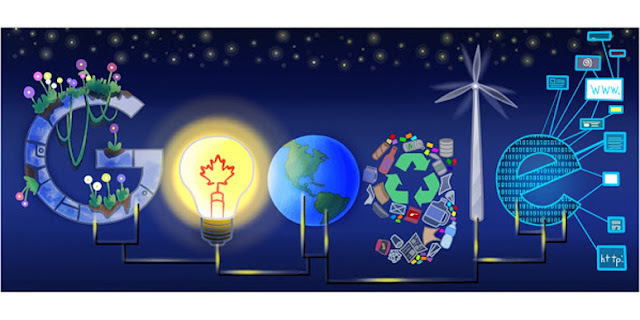 These are just some of the great ideas that Canadian students, from kindergarten to grade 12, came up with for Canada’s second Doodle 4 Google contest. 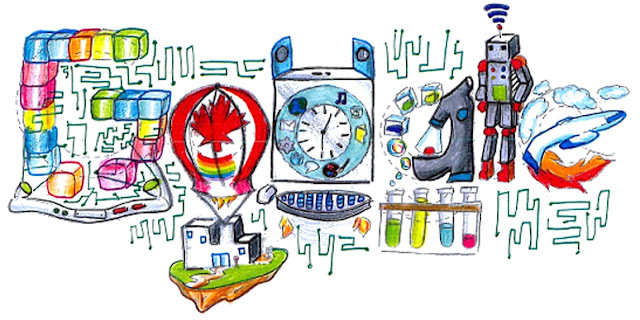 Back in March, we asked students across the country to use their imagination and create a doodle that answers the question “What I see for Canada’s future is…”, to celebrate Canada’s 150th birthday. 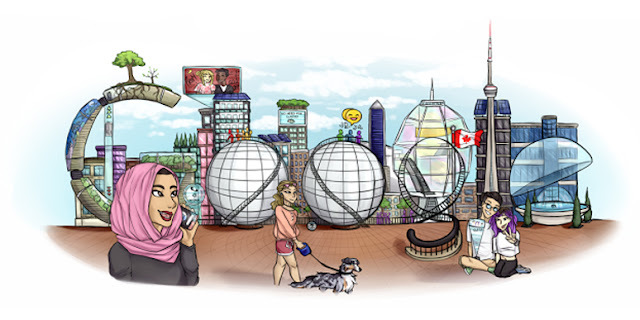 As a Google Doodler, I get to collaborate with some of the brightest artists, designers and engineers who create doodles, those fun and surprising illustrations on Google's home page. I jumped at the opportunity to be a judge in this year’s contest and help the next generation of artists, animators, and engineers explore their creative sides. 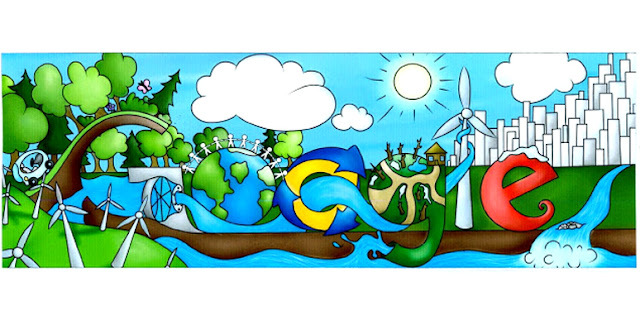 We were blown away by the thousands of students who submitted a doodle and shared their vision of Canada’s future -- from co-existing peacefully with nature to innovative and eco-friendly technological advancements. 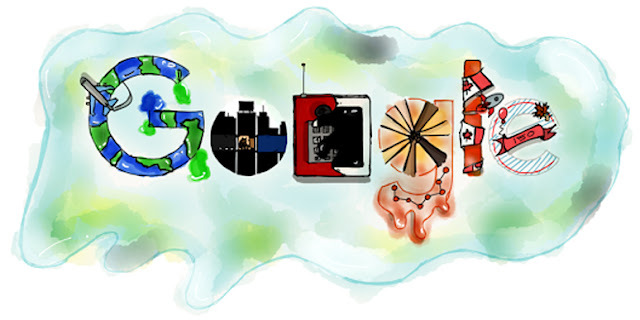 Now, Doodle 4 Google needs your vote! 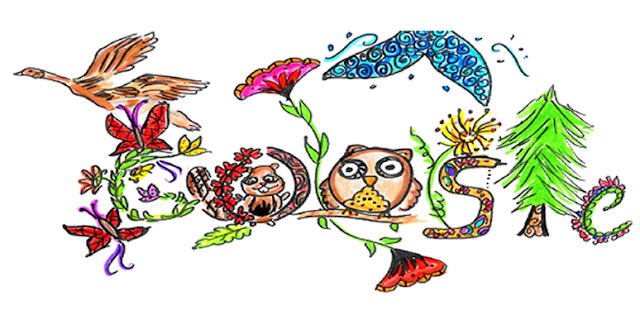 Help us pick the lucky Canadian student who will have their artwork takeover Google.ca for a day and win a $10,000 university scholarship. 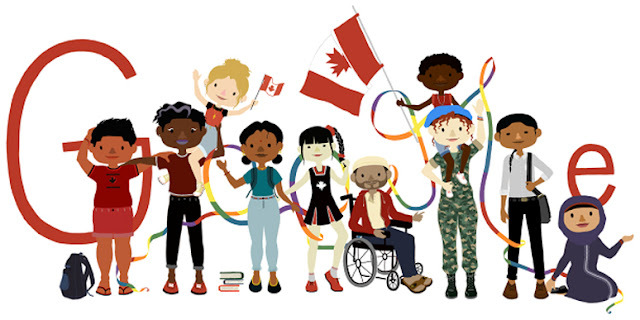 Check out this year’s 12 grade group winners below and head over to g.co/d4gcanada to vote for your favourite. Share and vote as many times as you want! Your vote will help determine our four grade group winners, who will receive a $5,000 technology award for their schools. 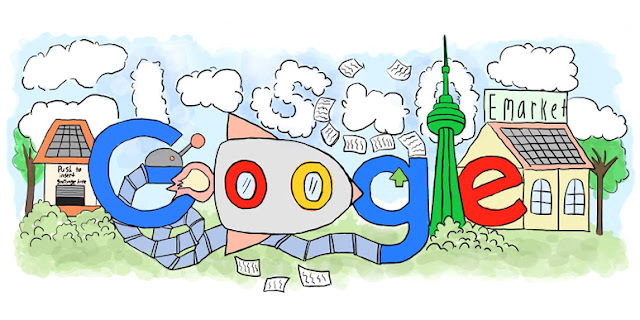 From there, we’ll choose our winning student, who will receive a $10,000 scholarship and a $10,000 technology award for his/her school plus have their doodle takeover Google.ca for a day! 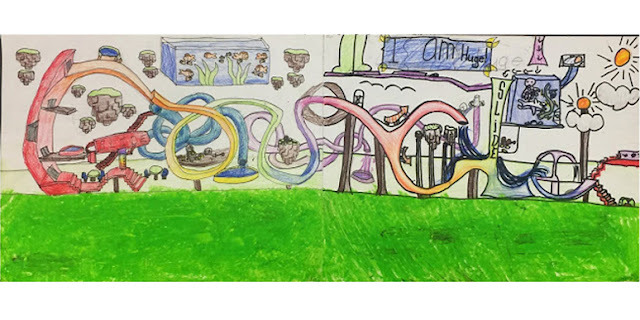 We’ll reveal the winning doodles at our finale event on June 13 at the Art Gallery of Ontario. 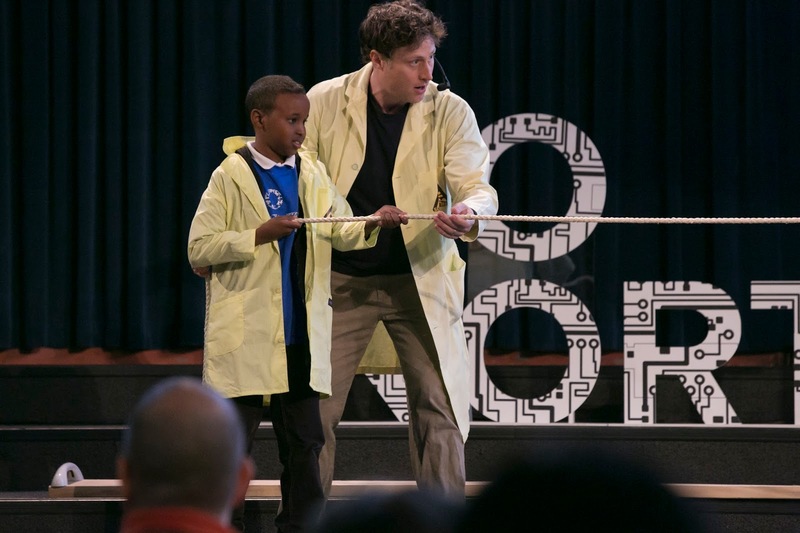 Today, at the University of Toronto’s Convocation Hall, over 1200 students gathered to explore, learn and have fun with science and technology at Go North - Inspiring Future Innovators. Building on the Go North technology summit, this one-day immersive event highlights the countless possibilities that STEM - Science, Technology, Engineering and Math - has to offer. The day is run by Actua and the University of Toronto’s Engineering Outreach team, who are national leaders in STEM programming. The participants, in grades 4 to 8, and their teachers engaged in hands-on workshops meant to spark a passion and stimulate a curiosity in STEM. We kicked off the day with Phil McCordic, host of Science Max, who brought the 1,200 students in Convocation Hall to their feet with his immersive performance. The partnership between the University of Toronto, Actua and Google is built on the shared goal that this experience will ignite and inspire these young students to consider computer science as not just a field of study but as a way to solve the big world problems of the future. According to the World Economic Forum, 65% of students entering primary school today will ultimately end up working in jobs that don’t yet exist. U of T, Actua and Google recognize the urgency of fostering an interest in STEM and the critical need to help equip students with skills they will need to excel. In Innovate Alley, a corridor lined with education startups and tools to help ignite curiosity, the students and their teachers had an opportunity to immerse themselves in hands-on workshops with U of T engineering students and Actua outreach instructors. For more than 20 years, Actua and our university network members have worked to prepare young Canadians to be innovators and leaders by engaging them in exciting and accessible STEM experiences that build critical skills and confidence. This includes our Codemakers program, supported by Google, which has engaged over 80,000 youth in computer science and digital skill building. 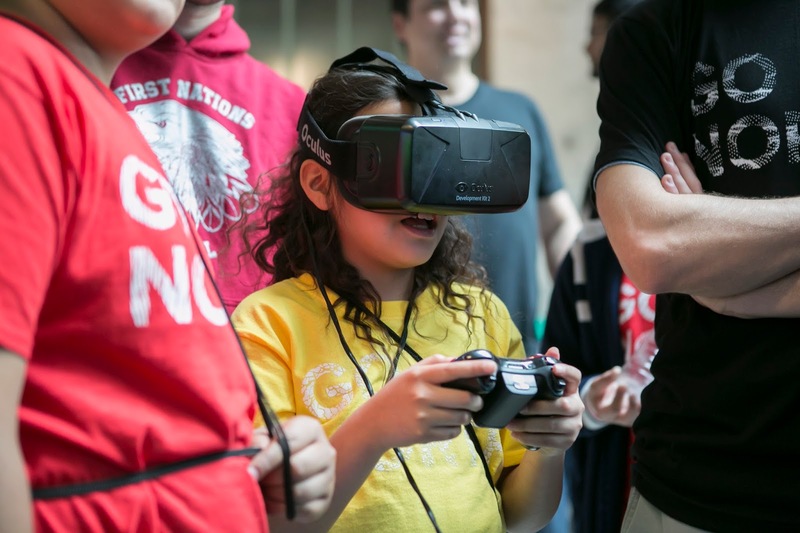 Canadian youth from all over this country have participated in Codemakers whether through coding throat singing in Canada’s north or printing 3-D selfies in Vancouver or participating in events like today. This unique partnership allows us to create unique moments of inspiration that connect technology to kids lives in meaningful ways. 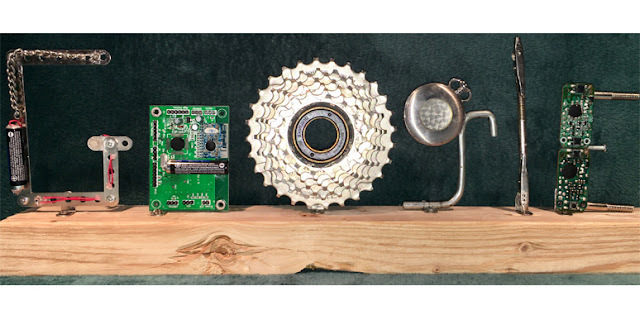 Together, we can show students that technology offers everyone the potential to create, to collaborate and to invent. Posted by Jennifer Flanagan, President and CEO of Actua. 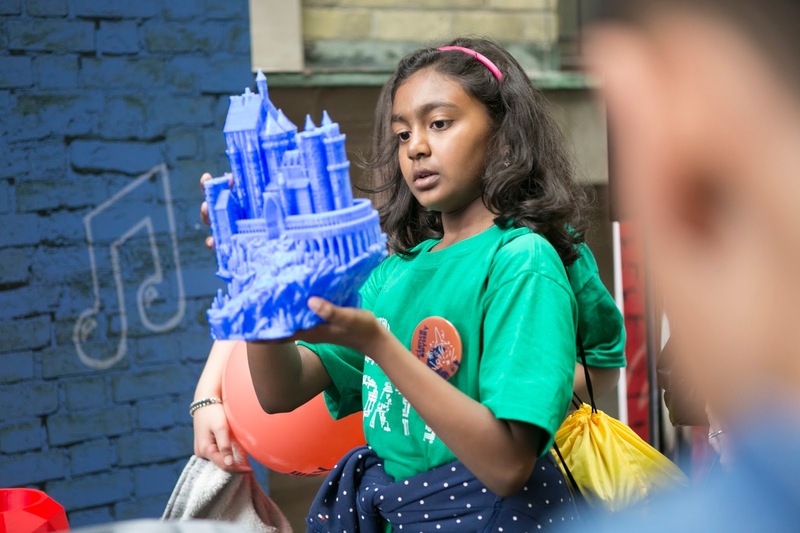 The University of Toronto is one of 34 Actua network members across Canada annually engaging 250,000 youth in hands-on STEM. with smart features in English, Brazilian Portuguese and Hindi. Today, we’re adding support for these features in French, thanks to our latest update. Now, for the first time ever, Canadians will be able to interact with their Google Assistant in French! Google Allo is our smart messaging app for Android and iOS that helps you say more and do more right in your chats. You can get help from your Assistant without ever leaving the conversation. Sharing sports scores, recipes, or travel plans in French is now easy to do right in your chats with friends. To start using the Assistant in Canadian French, just say “Talk to me in Canadian French” when you’re chatting with your Assistant in Google Allo. You can also adjust the language setting for your Assistant on your device. So whether you’re looking into weather forecasts for your trip to The Laurentians or for directions to the Olympic Stadium, add @google to your chat and your Assistant is ready to help. We’ve made Assistant be truly French Canadian, customizing the app with local elements that are unique to Quebec. From local celebrities and artists to landmarks and cultural institutions, you can ask the Assistant to answer questions that are specifically relevant to French Canada. We’ve found that Smart Reply in English has been helpful in sending quick responses while you’re chatting on the go. We’re now adding support for Smart Reply in French, so you can quickly send a “Oui” in response to a friend asking “Es-tu en chemin pour la partie de soccer?”. Smart Reply will recognize the language you’re chatting in and begin to show suggested responses in that language. If you’re chatting in English, it will continue to show English responses. But if you start chatting in French, it will show you suggestions in that language. Coming soon! Smart Reply will also suggest responses for photos. If your friend sends you a photo of their pet, you’ll see Smart Reply suggestions like “Trop mignon!” And whether you’re a “ah ah” or “😂” kind of person, Smart Reply will improve over time and adjust to your style. We can’t wait for you to say bonjour to Google Allo! We’re beginning to roll out these new features in French for Google Allo on Android and iOS, and they will be available to all users in Canada in the next few days. In addition to French, we’ll continue to bring the Google Assistant and Smart Reply to more languages over time — stay tuned for more! @Google, ou est le marché Jean-Talon? Last year, we launched Google Allo with smart features in English, Brazilian Portuguese and Hindi. Today, we’re adding support for these features in French, thanks to our latest update.